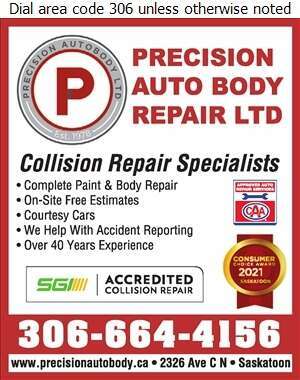 Precision Auto Body Repairs Ltd. has been serving the Saskatoon area for over 40 years. Our commitment to quality has been proven by our investment in the best equipment and training available. We are a Certified Collision Care shop recognizing OEM repairs for Ford, Chrysler, Dodge, Jeep and more. Our shop is one of the few CAA-approved auto collision repair facilities in the whole province. With over fifteen thousand square feet of space, we are able to service large vehicles, RVs, and semitrailers. Come to Precision Auto Body next time you need work done on your vehicle.